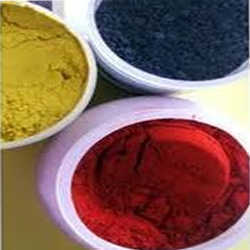 We are a leading Exporter of salt free colour dyes from Mumbai, India. Our salt free color are colored substance that has a strong affinity to the substrate to which they are applied. These salt free dyes are applied in an aqueous solution, and are used in dyeing of fabrics. Prepared from qualitative raw material, our salt free dyes produces fast colors in fibers placed directly in the dye solutions. We offer the dyes in different composition and packaging as specified by our clients.